FIXYOURTHINKING.COM / Need a brain? Borrow mine! 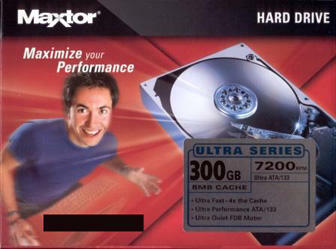 : A Hard Return: Man Returns Hard Drive Because He Never Got It! A Hard Return: Man Returns Hard Drive Because He Never Got It! [A Florida-area man claims to have been sold a box] that was supposed to contain a new Maxtor 300GB hard drive, and was instead filled with two D batteries and a “rusty yellow battery pack. Speculation is that either a foreign factory worker has some sticky fingers, or that a Staples employee is pulling some shady warehouse shenanigans (Retail employee theft? We'’ve never heard of such a thing!). Things like this happen quite often. RFIDs will stop this kind of thing eventually. RFIDs should also be able to track the full process of the sale from factory to distributor to buyer. So, a return such as this could be investigated all the way up the chain of manufacture and sale. In this case, if no "channel tampering" could be determined by the RFID, then the customer would be faulted (and arrested for fraud). Staples corporate would have been wise to just keep this guy mum and appease him, ask him to sign a waiver, then investigate him. When people such as this gentleman report this kind of thing to news outlets - something always smells funny to me. Competition? Vengeance? Fraud?